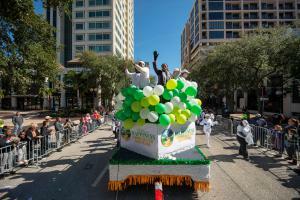 ST. PETERSBURG, FLORIDA, US, January 24, 2019 /EINPresswire.com/ — On January 21st, The Way to Happiness Association of Tampa Bay joined one of the country’s largest Martin Luther King Jr. Day parades in St Petersburg Florida, with over 60,000 attendees and live TV coverage reaching 2.1m people over 2000 booklets were distributed that morning. 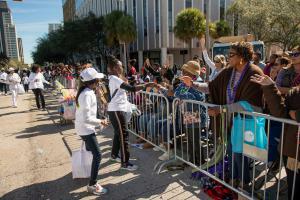 The celebration marked the 34th year of the Nation’s longest-running parade – the St. Petersburg’s “MLK DREAM BIG” Parade. The Way to Happiness float was prepped with banners, balloons and posters. The Flag Band, Scientology’s band, joined the thirty-one youth promoting the 21 precepts of The Way to Happiness booklet by L. Ron Hubbard. With sirens of the local police and city officials heading the parade, the Flag Band played music along the full length of the 1.5mile route of the parade. “It is our honor to celebrate the life of Dr. Martin Luther King, Jr. a man who exemplified the virtues promoted in The Way to Happiness,” said Tanja Cranton, the Executive Director of The Way to Happiness (TWTH) Association of Tampa Bay. 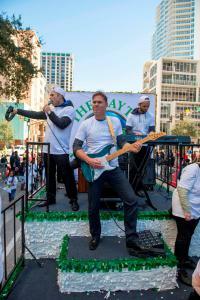 Over 2,000 The Way to Happiness booklets were distributed to the crowds lining the parade.